This quintessential celebration of Māori art, achievement, enterprise and creativity is coming back to Wellington this March. Established in 2007, after a highly successful inaugural event held at the Yerba Buena Centre in San Francisco in 2005, which was a key component of the important Māori Art Meets America project which resonated in the media throughout North America. The event has since been hosted at Te Raupraha Arena in Porirua (2009 and 2011) and the TSB Bank Arena in Wellington (2007 and 2014). 2017 sees a new home for the iconic event at Te Wharewaka o Pōneke on the Wellington waterfront in the footprints of the historic Te Aro Pā, home of mana whenua of Te Whanganui a Tara iwi Te Atiawa up until the 1880s. Spread over lthe ground floor of Te Wharewaka the Art Market Gallery will present a comprehensive showcase of contemporary Māori art through artist exhibitions, talks, and demonstrations. The Market showcases a huge range of Māori art that also incorporates traditional practices including raranga (weaving), whakairo (carving), tā moko (tattoo) and taonga uku (claywork) through to cutting edge contemporary pieces. The ground floor Gallery will host 5 art galleries featuring the works of accomplished Māori arts practitioners including Rangi Kipa, Darcy Nicholas and Lewis Gardiner plus international indigenous guest artists such as Canadian Dempsey Bob. As well as new talent from 3 of Aotearoa’s leading Toi Māori Wānanga – Gisborne’s Toihoukura, Hawkes Bay’s Toimairangi and Ōtaki’s Te Wānanga o Raukawa. 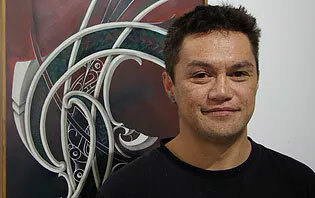 Rangi Kipa (born 1966)is a sculptor, carver, illustrator and tā moko. 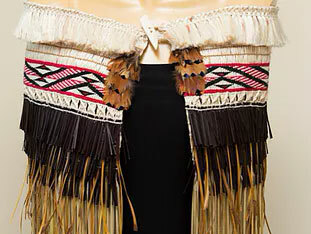 Kipa is probably best known for mixing customary Māori motifs and techniques with non-traditional materials. He is also interested in (in his own words) “participating in the revival of a number of Māori art forms that were affected by the colonial process in New Zealand”. Darcy Nicholas is a leading contemporary Maori painter, sculptor, writer, curator, events manager, and commentator on Maori issues. He has exhibited throughout New Zealand, Australia, Africa, United States, France, Britain, Canada. 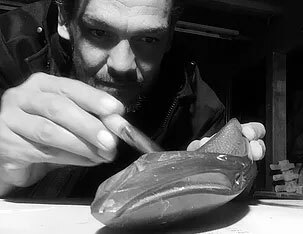 Lewis Gardiner is regarded as one of the most innovative and respected Māori jade artists of his generation. 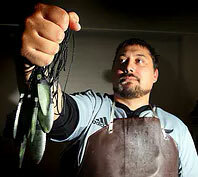 In 1994, he graduated in Māori Craft and Design at the Waiariki Institute of Technology in Rotorua. During his final year he was introduced to the valuable medium of pounamu (jade) and was immediately attracted to its artistic possibilities. Tlingit/Tahltan artist of the wolf clan Telegraph Creek BC, Canada. 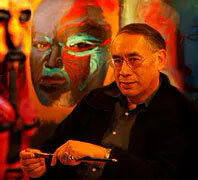 A long-time friend for the contemporary Maori artists movement. 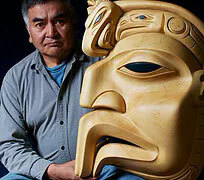 Dempsey is an internationally recognised sculptor, and innovator of Northwest Coast Art sculptural style. He has been visiting New Zealand for some 10 years. Set up in 1996 as an umbrella organisation for the promotion of Māori art and artists, Toi Māori Aotearoa promotes contemporary Māori arts through programmes and projects in events in New Zealand and internationally. In more recent years, it has developed an agency role providing artists for publication, exhibitions, performances and promotions, as well as establishing relationships with producers, presenters, and curators of Māori art. Increasingly new Māori artist groups have been established through shared art practice, region and iwi. Toi Māori Aotearoa looks to such groups for partnerships and joint ventures. Tangimoe Clay (Ngati Ngahere of Whakatohea) is a renowned basket maker based in Opotiki. 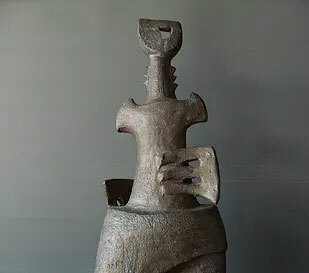 Her work is widely acknowledged as meeting the very highest standards of traditional practice as well as embracing innovation and experimentation in terms of form and material. When starting out on a work, Tangimoe is always attracted to the kaupapa and the challenge, mulling over ideas that span from her childhood to the present day. She prefers working with organics and fibres, and creating something new over repetition. Poi holds her interest for its functionality and its elegance, and the opportunities for variation on design are endless. Jill was drawn to traditional handmade craft at a young age and trained in clothing and textile design. She finds the rhythmic, repetitive nature of weaving transports her to a place of peace and grace , and is inspired by and indebted to the tohunga mahi (expert weavers) and others who have shared their knowledge, passion, and expertise with her. Tracy Keith was born and raised in Tokoroa, has a diploma of Māori Visual Arts from Waiariki Institute of Technology, and a Masters of Fine Arts from Whitecliffe College of Art and Design. An art tutor for Te Wananga o Aotearoa for 16 years, Tracy has been taking part in art, indigenous gatherings and exhibitions for 25 years. 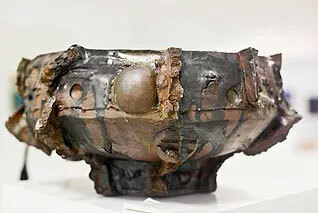 Tracy's ceramic sculptures are a mix of abstract and traditional forms. 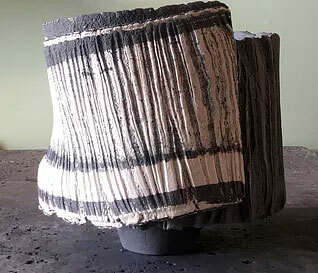 He chooses to work with clay because for its organic response and seductive qualities - it's a medium with chameleon characteristics that reveals its true possibilities through the stages of construction. Kaaterina Kerekere has been working as a freelance artist and graphic designer for over a decade. 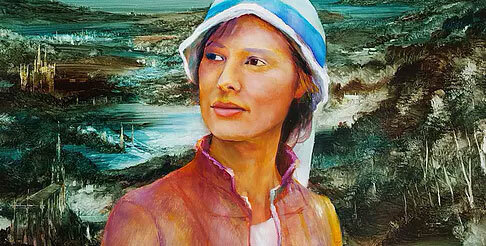 A mixed media artist, her works on canvas and board explore themes that express both spiritual and physical connections to the land and sea. 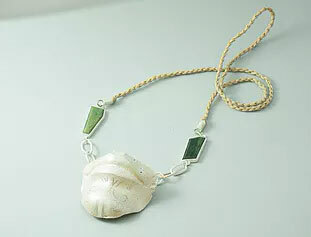 Kaaterina also works with silver and semi precious stones to create ‘one-of-a-kind' adornment pieces. While most pieces are designed primarily as jewellery, she intends them to be awareness raising as well. 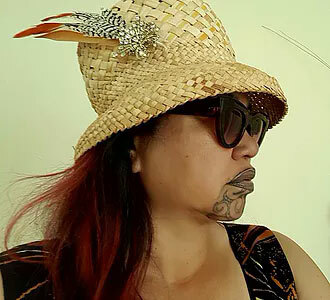 On top of that Kaaterina is involved in research assisting her iwi reconnect with taonga housed in museums and institutions throughout the world, which provides even more inspiration to her work. Tai Wiremu Kerekere works as a full-time artist, designer (and dad) from his home-based studio in Ūawa. His artwork ranges from small handcrafted adornment pieces through medium-sized acrylics on paper, canvas, clay, wood, silver and copper, right up to large two-dimensional works. Through them, he says, he expresses the anguish, the conflict, the confrontations, the movement and the development of his culture and people. While Tai's artwork is his passion, he recognises it can't fully sustain his whānau. His move into graphic design has been an opportunity to provide an income while maintaining a creative identity. Jess Paraone is a weaver and sculptor. Whether she's working with clay, fibre or a piece of wood, Jess approaches the material with the understanding that it has its own intelligence and if she's light enough on her feet she can respond to it. Jess is currently working with raku and porcelain clays. Raku, admired for its strength and stability under stress is layered with porcelain, a delicate clay with fine translucent qualities. The use or 'misuse' of these clay bodies together makes a statement of the politics of engagement that has been a driving force in all of Jess's work. 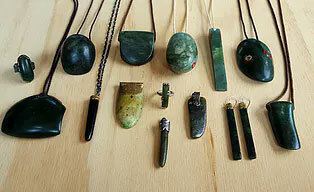 Neke Moa is a jeweller, working mainly with stone, pounamu and other locally sourced materials. She has exhibited widely, throughout Aotearoa and also internationally, as part of The Handshake Project 2010-2017 and the Wunderrūma exhibition 2014-2015. Some of Neke's work, which she took to the special exhibition Schmuck in Munich in 2015, has been purchased by Te Papa Tongarewa, as part of their contemporary jewellery collection. Neke says her work is a reflection of herself and a development of cultural, political, environmental and social interactions: "at times on a subtle subversive level and other times screamingly obvious!" Baye Pewhairangi Riddell began working with clay back in the 1970s. 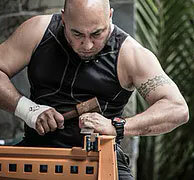 Living in his tribal area on the East Coast, he prefers to use local clay dug from his family land, out of respect for the material and a sense of connection with his tipuna. Baye forms his pieces by hand and on a wheel - each one is unique. He sees that as a metaphor for life - an artwork to be won and shaped from the experiences that befall us or that we choose to embrace and enter into. "Our art is an expression of who we are and what we believe in", he says. 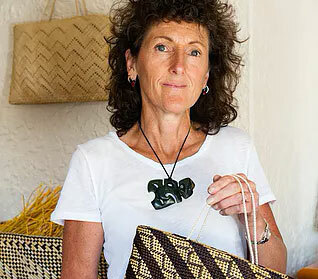 Sue Tucker's passion for Raranga is a natural development of her lifelong interest in a variety of arts and craft. 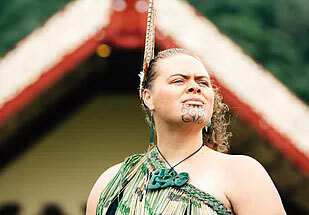 Sue initially studied Raranga at Te Kokiri, Levin, and then completed her Te Maunga Kura Toi through Te Wānanga o Aotearoa. The use of traditional materials - many grown on her rural property, techniques and processes, often combined with contemporary materials, is the basis of Sue's art. Sue's workshop is also used by other weavers and is open to the public. Sue enjoys sharing her knowledge with new weavers, as she sees this as vital to keeping the art of Raranga alive. Keri-Mei Zagrobelna is a jewellery designer. She comes from a background entwined in museums and art, worlds in which both her grandmother and mother worked - her art aims to acknowledge them and all her tipuna. Jewellery making is the medium through which Keri-Mei communicates her heritage to both local and global audiences. Jewellery is her language - and she speaks through her hands. Keri-Mei has previously exhibited at the Pātaka Gallery Museum and the New Zealand Academy of Fine Arts. She has also co-presented at the International JEMposium, and was a part of the New Zealand delegation that traveled to Guam for The Pacific Arts Festival. Te Atinga develops projects to promote contemporary Maori art through exhibitions, wananga (symposia), publications and artist networks operating within regional to international tribal or urban centres. Te Atinga fosters the development of emerging and established painters, sculptors, clay-workers, print-makers, digital and multi-media artists. Regan Balzer works across a range of art genres - paint, graphics and photography – with passion and skill. She completed a Masters in Māori Visual Arts at Massey University in 2011 graduating with honours, and has gone on to exhibit nationally and internationally. Regan’s work is inspired by the sulphuric landscape of her hometown Rotorua, New Zealand – her paintings use those vividly contrasting colours intertwined with contemporary iconography. Regan incorporates elements of her heritage such as Māori woodcarving and weaving into her work to develop visual narratives, often as a response to past or current issues that affect her and her people. Davina Duke is based in the Bay of Islands where she works as the Head of the local college’s Art Department, and is an established ceramic artist. She holds that art education is a questioning process that requires a peeling back of the layers and a sense of individual discovery for each student. Her own works carry the classic Puhoro design that she has loved, explored and developed over time practicing with clay. 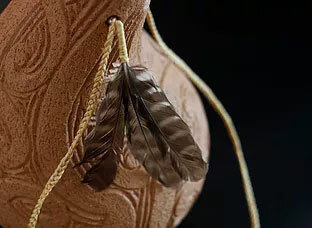 The pots have a specific Taitokerau connection and the nature of the Puhoro design can be organic, structured and or both. Davina enjoys the constant ever-changing possibilities that this particular design has offered her in the past and present. Rhonda Halliday grew up not knowing her Maori identity or being taught factual NZ history until her adult years. 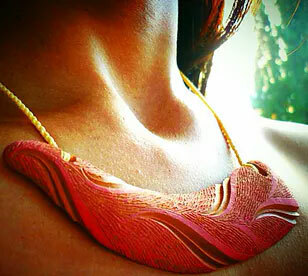 She now uses clay to express and interpret what she has learnt on her journey of self-discovery. Her personal discoveries are transformed into serene birthing forms which she feels best describes the emotions and realisations of being ignorant and then being reborn. Rhonda has been helping to run the biennial Ngapuhi Festival since 2008, and was also a member of a small uku group, part of the NZ delegation at FOPA in Solomons 2012 and Guahan 2016, along with cultural exchanges with Queensland Aboriginal artists between 2010 and 2015. 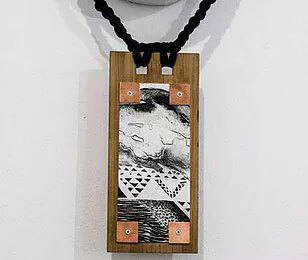 Jasmine Horton is a printmaker and silversmith based in Whangarei. She graduated with a Bachelor of Applied Arts - Visual, from Northtec in 2006. As a graphic designer Jasmine got to grips with the complexities of commercial print and her love for paper, print and design flourished. In 2010, Jasmine purchased a 1952 Hiedelberg platen printing press and started printmaking from home. Her love for letterpress led Jasmine to a part time position as a Fine Art Print Technician at Te Kowhai Print Trust where she is now the manager. Jasmine’s work has featured in galleries and exhibitions throughout the country. 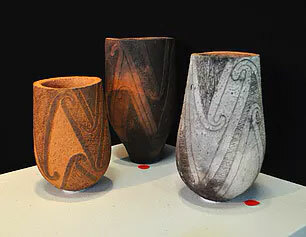 Stevei Houkamau is a member of Nga Kaihanga Uku (Maori Clayworkers Collective). Her fascination and journey with clay started with a small pinch pot at a Wananga in 2011, and has continued to grow. Her works reflect the influence of her whakapapa and of her surroundings growing up in Porirua. There’s strong integrating of Maori and Pacific Island patterns derived from Ta Moko and Tatau. 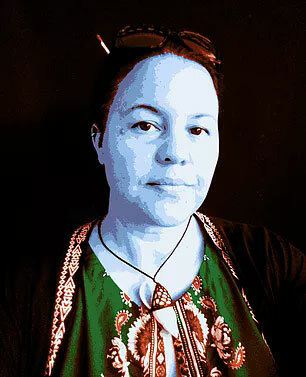 Stevei has exhibited in many group exhibitions throughout Aotearoa (New Zealand) and overseas, and her work is held in national and international collections. Recently Stevei has started to cross over into other mediums such as print making and tattoo. Hera Johns is of Maori, Welsh and Latvian descent and was raised on Karikari Peninsula in the Far North. She is a self-taught clay artist who finds working with Uku (clay) connects her with Papatuaanuku. Being a self-taught artist, Hera finds that she’s free from creative constraints and enjoys working with a variety of mediums. Working with Uku has been a gradual evolution - she started with bone, shell and sandstone carvings, but for the last ten years has concentrated on Uku. Hera has exhibited internationally and nationally, and has been invited to attend the “Tears of DukwibahL” 2017 Gathering of International Indigenous Visual Artists in Washington. Jimmy James Kouratoras is a New Zealand artist of Māori (Ngati Tiipa, Tainui) and Greek heritage whose work has received critical acclaim both at home and internationally. Over the past 25 years he has developed his own unique style: a combination of surreal expressionism with vivid pop colour combinations creating powerful visual narratives. Jimmy James has worked in the film industry as a scenic artist for almost two decades. He has exhibited his work across New Zealand and internationally including Los Angeles and Ora Gallery in New York City. He is also the People's Choice Award Winner for the Brisbane Contemporary Art Prize 2016. Faith McManus of Maori (Ngapuhi, Ngai Takoto), Irish, English and Croatian descent. 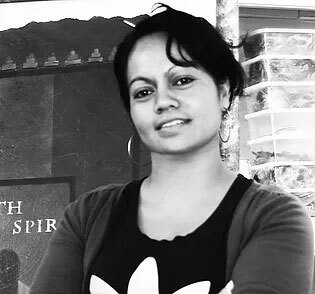 A lecturer in drawing, printmaking, intermedia and Pacific studies art history at Whangarei’s NorthTec, Faith has a DipFA (Hons) from Otago Polytechnic, and a MFA from RMIT Melbourne. She has exhibited in New Zealand, the US and Australia, and has work in public and private collections in NZ and overseas. Much of Faith’s work explores ideas about cultural identity and whakapapa. The most straightforward translation of whakapapa is genealogy, but on a deeper level it is about the connection and relationship of all people, things and places, and that idea of interconnectedness underpins all her work. Leonard Murupaenga was born and raised in Pukepoto in Northland and moved to Whagarei where he gained a Diploma in Applied Arts at Northtec. 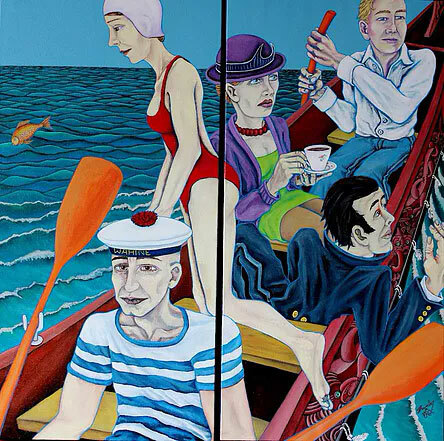 Leonard has shown his paintings in over 40 exhibitions and has curated 9 shows. His recent work reflects two of the most influential people in his life - his parents. Leonard’s visual story telling has changed dramatically since the passing of his Father. Coping with loss is a process, he says, and one we all deal with differently. Preserving the memory and legacy of those he has lost has been the inspiration in his recent works. BJ Natanahira is a painter and sculptor living in the Far North, and has been working in the arts for for nearly three decades. Currently teaching music at Kaitaia’s Abundant Life School and chair of the school’s Board of Trustees, BJ is proud to have been part of the Tai Tokerau Maori Arts Collective and has settled on painting on canvas as his form of expressing his art. His inspiration lies in Maori historical stories and the world around him. And, because he lives in the bush, his passion is working to preserve his cultural identity and the environment because, he says, they are one and the same. Tawhai Rickard has practiced Maori art since 1990 through wood and bone carving. under the tutelage of the late Ivan Ehau and Kupe James Rickard. Since then he has learnt to combine diverse materials and experiment with various styles within the dynamic theatre of Maori culture. In 2014 Tawhai won the supreme award prize at the Gate Pa 150 year Commemorative Art Exhibition Tauranga. He has coined the term “Hinetapora Style” for his work – it refers back to the figurative folk art paintings of his ancestral Ngati Porou meeting house. Tawhai recently enjoyed a successful sell out show at the Paul Nache Gallery in Gisborne. 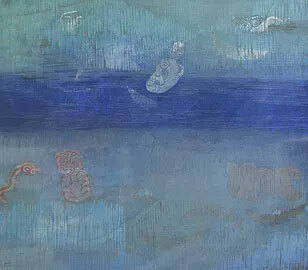 Steve Gibbs, artist, researcher and art educator, is a Principal Lecturer at Toihoukura. Working predominantly in paint on board and canvas, he explores the symbolic connections between bird, fish and whakapapa. Finding Tūranganui-a-Kiwa a major source of inspiration, Steve endeavours to address through his work specific environmental issues of importance to Māori, and incorporates motifs of animals and nature alongside those of his Ngai Tamanuhiri and Tairāwhiti iwi. Makarini Solomon grew up on a farm in the small country community of Tiniroto, 57 km inland from Gisborne, and works as a tutor at Toihoukura. The school has played a major role in his life in terms of his knowledge of whakapapa, traditional narratives and artistic expression, as has his exposure in recent times to a wide range of national and international artists. 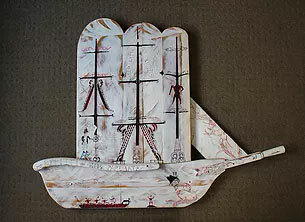 Makarini uses native timbers, metals, feathers, shells, fibre, clay and stone in his works. Te Ao Māori is his key influence which he says will continue to guide his art in the future and which he strives to pass on to others. Henare Brooking was born and raised on the East Coast, immersed in Māori arts and culture. 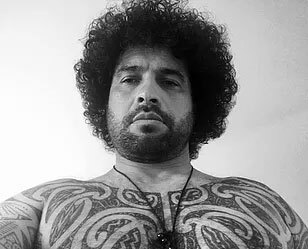 From the age of 9 he trained in the art of tā moko, and by the time he’d reached his teens had developed a well-founded knowledge of both the practical aspects and associated protocols of traditional tattoo. As an artist and now a tutor at Toihoukura, Henare is working with young emerging artists, passing on his skills to help them achieve their dreams and aspirations. Erena Koopu was one of the first students to graduate from the programme at Toihoukura as the Ruanuku/Top Student. After a year’s postgraduate study Erena taught at the Te Kura Kaupapa Maori o Rakaumangamanga before being coaxed back to Toihoukura where she is the programme coordinator and senior lecturer responsible for the degree course. In 2016 she completed her MA MA with first class honours. Art, inspired by Te Ao Māori, has always played a major role in Erena’s life - from performance to music to drama, but visual art is her true passion, and she’s travelled all over the world sharing that passion. 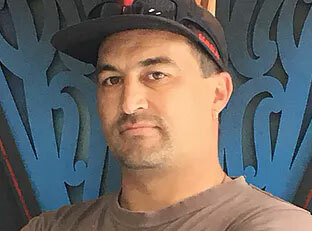 Derek Lardelli is a practising Tā Moko artist, painter, carver, kapahaka performer, composer, graphic designer, researcher of whakapapa and oral histories and kaikōrero. 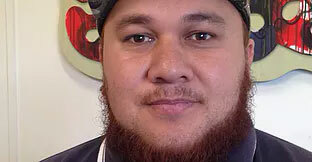 He is also an arts educator and mentor at Toihoukura. 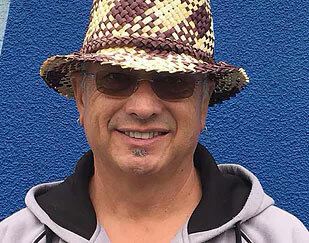 As chairperson for Te Uhi a Mataora Tā Moko Arts collective, Derek has been heavily involved in the retention and development of the rituals, karakia and oral histories associated with Tā Moko. As a sculptor he has completed major projects such as the Maui Whakairo for Hikurangi as part of the Ngāti Porou millennium, is a cultural advisor to the All Blacks and composed their Haka, Kapa O Pango, first performed at the Rugby World Cup in 2011. 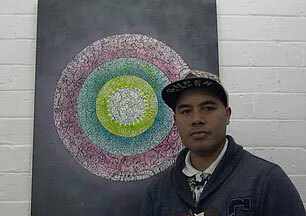 Ayson Lewis is a mixed media artist born and raised in the small East Coast community of Tokomaru Bay. One of the first students at Toihoukura, Ayson became a fulltime artist in 2000, specialising in stone and wood carving, garden and gallery sculpture and Mäori design. His overseas experiences include an Aesthetic Arts programme at the McCullum Arts Institute in Palm Desert, California, and an artist’s residency at Ballance House in Belfast, Northern Ireland. Ayson’s connection to his tribal lands, its coastal surroundings and rustic, largely undisturbed natural resources continue to inspire him today, providing a blueprint for the kind of Māori artist he aspires to be. 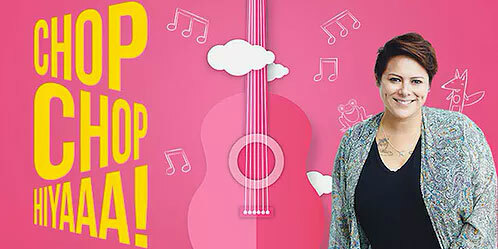 Welcome to the terrific, wonderful and magical world of Anika Moa! A voice that can lull you to sleep in one fell swoop and then get you dancing on the clouds of where-to-next land. Hot on the heels of Anika Moa's second album Songs For Bubbas 2 comes a show that will take you on a furious ride alongside unwelcome hungry animals and a rat that loves to Chop, Chop, Hiyaaa! Sit back and laugh until you cry (tears of joy obviously) while Aunty Anika takes care of you for 45 minutes of naughtiness. This show is full of singing, dancing and frightful fun so nau mai, haere mai ngā tamariki mā! By Witi Ihimaera. Adapted for the stage by Tim Bray. Made famous by Niki Caro's award-winning 2002 film, The Whale Rider tells the story of Kahu, a young Māori girl destined to become the leader of her tribe. No matter how hard she tries to show her worth, her grandfather won't accept that a girl can take over his role as chief. However things change when Kahu rescues the ancient whale beached in the Whangara Harbour. Heilmler and Proc's All In The Same Waka Exhibition takes the viewer on a voyage through the origin and identity of New Zealand, a prosperous nation whose cultural roots and current diversity are reflected in the paintings. In this sense, the artists invite us to journey across the ocean in search for land; to sail on a Waka, the sacred canoe and recognizable Maori symbol for odysseys of discovery. The Exhibition also offers a look at New Zealand´s current cosmopolitan society, and a glimpse in its future. The Waka comes to symbolize New Zealand. It then becomes a microcosm in and of itself, incorporating elements of human behaviour much as it is in the rest of the world. 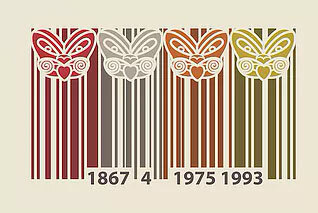 contemporary Maori artists. The 6 contemporary artists are pioneering a unique approach to portraiture that blends contemporary culture with indigenous concerns.